Richmond International Academic & Soccer Academy (RIASA) will take on Athelite’s Sports Agency (ASA XI) in a special showcase game on Monday 12th November at Harrogate Town’s Wetherby Road Stadium. In what is a first for RIASA, the showcase squad will take on a specially selected team of ASA free agents from across the UK. The game will allow both RIASA Student-Athletes and ASA XI free agents the chance to showcase their talents for club representatives and coaches in attendance. The showcase game will be live streamed at riasasoccer.org/asashowcase/ on Monday 12th November at 19:00 BST. In addition, live updates can be found on Twitter @RIASAMatchday. Who will be playing for RIASA? The RIASA Showcase squad consists of 16 of the best players at RIASA at the current time, all specially selected by Coach Jones. On the day, attendees will have access to a list of the RIASA Student-Athletes featuring their country, position, squad number and age. If you would like to request an invite to the game to observe the talent on display from both sides, fill out the contact form below. Want to experience RIASA? 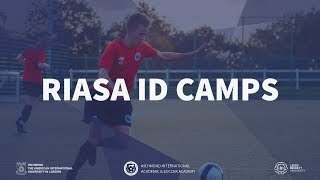 Sign up for a RIASA ID Camp here.